The "Kid in the Closet" stays in the picture. What an amazing ride! It has been a series of serendipitous events and a lot of hard work that has paved my path in movies. Here is a place to catalog my work in pictures. "The effects are unusually vivid and imaginative." Go to the movie website. Check out my Filmography and resume on Linkedin, and then Linkin with me! and of course online at amazon. You can order your copy here!! 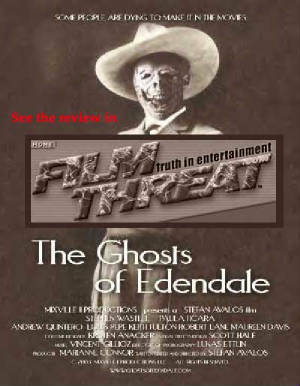 I spent more than 6 months working everyday on Ghosts of Edendale, and it proved to be a great training for what whas about to unfold. I tried to find more freelance gigs in L.A. and it wasn't looking good. I got a job at Media Island Post, a post production house in North Hollywood. I worked there for a few weeks. During these last few months of Ghosts of Edendale, I was sending of flurries of reels and resumes with the work I had done on ghosts and the best of my college work. In the early spring of 2003 I got a call from Tippett Studio wondering if I would be interested in coming up to Berkeley from L.A. to work on Starship Troopers 2. I was a fan of the original film and was blown away by the chance to learn how they really do it in the industry. This was an opportunity to learn from the best. Needless to say, I packed up and came up to sunny Berkeley. I worked along side Phil Tippett, Eric Leven, Pete Konig, and Jon Davidson. The experience was rewarding beyond words. This was my first movie at Tippett. 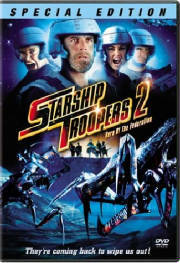 Starship Troopes 2 is avaliable now! Click logo to go to the official site. Richard Burgi, of Starship Troopers 2 at Tippett. 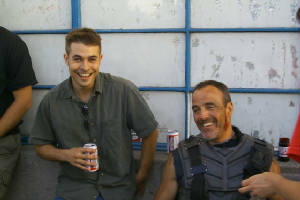 Scott and Richard share a Bud and talk movies. Click on photo to go to the Richard Burgi Fan Site. What an experience. My first 35mm film. After all my efforts, I didn't get a credit. But you can see a bunch of my comps in the film and in the deleted scenes. Some artists who got credit ended up with all their work cut out of the theatrical version. All of Loki's powers of mischief at my disposal! And I will use my power to ROCK!!! After The Son of The Mask I went down to Cafe Fx in Santa Maria to work on Robert Rodruigez's Sharkboy and Lavagirl. This was a 3D glasses movie. The Adventures of Sharkboy and Lavagirl in 3D click here for trailer and official site. One of my comps that was in Millimeter Magazine. There was a cool article about 3D filmmaking. Click to enlarge. I am back from Santa Maria! Thanks Cafe Fx for a great show! "The Adventures of Sharkboy and Lavagirl" the new 3D movie by Robert Rodriguez comes out on DVD Sept 20th! Robert Rodriguez directed El Mariachi, Desperado, From Dusk Till Dawn, Spy Kids, Once upon aTime in Mexico, and many more. I read his book, "Rebel Without a Crew" in college, and it influenced my filmaking very much. Sharkboy and Lavagirl was awesome! The 3D looked great!! After returning to the San Francisco bay area, I worked at The Expression College for Digital Art. During this time, I did freelance compositing work for my pal Lance Weiler on his first film since the acclaimed film "The Last Broadcast". "Head Trauma" is a psychological thriller that packs a mean punch. I was glad to lend a hand on this gem! But after 6 months of inspiring students, I was ready to get back out there. 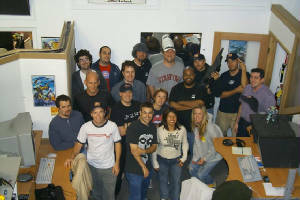 I was offered a compositing position at Tweak Films on the movie Invincible. Watch out for my Compositing work in "Invincible" with Mark Wahlberg and Greg Kinnear on DVD! "Invincible" is about the 1976 Philadelphia Eagles and the "walk on" player Vince Papale. It opened #1 at the Box Office and recieved "two thumbs up" from Roger Ebert. Tweak Film's contribution is over 50 crowd creation shots with ambitious camera moves and dynamic lighting. Check out the trailer online! "Next" starring Nicholas Cage and Julianne Moore is a wrap! Tweak's contribution is an ambitious shot involving a nuclear blast and total destruction of San Pedro Harbor in Long Beach. I have been a technical director on the show. More specifically I have been working with textures and UV maps and making sure everything is high enough resolution. I am also painting and redefining surfaces, doing preliminary compositing and contributing to look development. Here is a movie NEXT's trailer with almost the entire shot that I worked on the textures for. Congratulations to Tweak Films for gettin' it done! After a great run at Tweak Films I got an offer I couldn't refuse! In the fall of 2006 I began talks with ILM to work on "Evan Almighty" I came aboard (no pun intended) and cranked out a number of finals including several shots which appeared in the trailers on television. Some of my work can be seen here in the following trailers. I worked at ILM on EVAN ALMIGHTY, starring Steve Carell. I was RIGHT!!! as per my above prediction. EVAN ALMIGHTY TOPS THE BOX OFFICE! Here is the plot summary posted on IMDB. The last time we saw Evan Baxter (Steve Carell), he was being tormented by rival Bruce Nolan onscreen, live from their Buffalo TV station. But as time passed and Evan has made up with Bruce, he's gone onto bigger and better things. Newly elected to Washington D.C. as a congressman, Evan has left Buffalo, New York in pursuit of a greater calling. But that calling isn't serving in the illustrious ranks of America's politics, but being summoned by the Almighty himself (Morgan Freeman), who has handed Evan the task of building a new ark, much as Noah did before. With time passing by and his family belittled by Evan's newfound realization, Evan will have to do the work that God has given him in what promises to be an unusual adventure for a man who just wanted to serve his country, might actually be serving humanity. Ain't it Cool News Review!! 4 stars! Latest trailer featuring some of my work! Click on logo to see ILM homepage. trailer with some of my work! After wrapping on Evan Allmighty, I took a gig working at Element Fx. They are a smaller, high end boutique studio, made up mostly of ILM alumi. I did some compositing and painting work for them on Rush Hour 3. I am back at Tippett Studio working on The Spiderwick Chronicles. Adapted from the New York Times Best Selling book series from Caldecott- winning illustrator, Tony DiTerlizzi, and Simon & Schuster the film will feature three siblings who discover a Field Guide in their Aunt's dilapidated house that offers them entrance into a magical world that exists all around us. As clues to the disappearance of their great uncle, Arthur Spiderwick, who is being held captive by the Fairies, is being unveiled; the siblings find themselves on a perilous journey into the adventure-laden world of fairies & goblins in a desperate attempt to rescue Arthur. 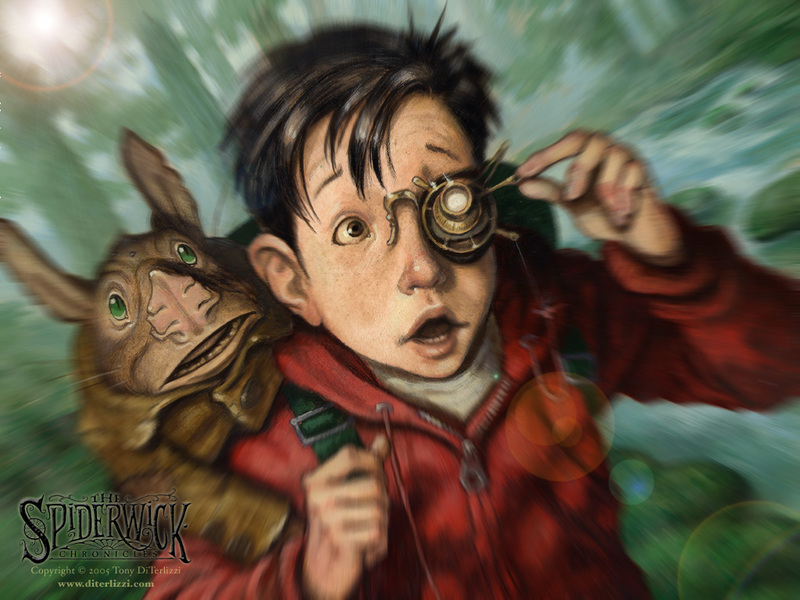 The Spiderwick (books) official site. I worked on "The Matches" music video, "Salty Eyes". Michael Coleman from ColemanFilm media group enlisted me to help out with some visual issues. We won the Alice 3 min. film fest for the music video catagory. He gave me a copy of Decomposer. The Matches latest album, and I WAS BLOWN AWAY!! This album rocks! It is an eclectic mix of Rock, punk, new wave, reggae, and electronica. I had heard them on Sound Check with Aaron Axelson but I didn't know that they were at the Warped Tour and SF's BFD from Live 105. I am now a big fan of The Matches! I rock them in my ride CONSTANTLY! Checl 'em out! You won't be sorry! Wish we got to meet at the Alice film fest night, but we were fulfilling our live band duties onstage in Santa Cruz that night. I'm writing again to let you know how damn much we are fans of your work. People ask me-- "wow! and none of the TV's malfunctioned?!" And I'm like "No! Can you believe it?!" Before I realize that we had about 50% of those screens in, and you sir, have been a wizard many times over. So of course I correct myself and inform them "Actually, half of the TV's broke, and a genius made the whole thing appear to be a single flawless take". Which is much more amazing than nothing going wrong in the first place. Thank you so much from all of us in the band! I hope we soon get the opportunity to return the great favor! and PS. congradulations on the (first) film fest victory with this video!! NEW Making of Video for "Salty Eyes"
Look at what it took to pull this off. The video has taking on a life of it's own! It has been featured on Youtube, and Spin.com! Awesome! The Animated Salty Eyes diagram. See who was where, when, during the video! Here is the Hi-res version!!!! Fall '07 in Santa Monica. Comen VFX is a rising star in the visual effects business! A small boutique studio that specializes in client relations, fast turn around, and top quality work. I worked on 4 movies there. "Otis", "David and Fatima", "Kill Theory", and "Loaded". The crew is great and they are very easy to work with. I hope I continue a relationship with Comen VFX and can produce more great work for them. They went out of their way to make me feel comfortable and welcome. It will be fun to see all the accolades that Comen VFX and the movies they work on receive! I returned to the bay area for the end of 07 and worked at The Orphanage on a commercial for Humira, an arthritis medication. Then I went to Evil Eye Pictures. Here is the NEW Speed Racer Trailer! From writer/directors Larry and Andy Wachowski, the creators of the groundbreaking "The Matrix" trilogy, and producer Joel Silver comes the live-action, high-octane family adventure, Speed Racer. Hurtling down the track, careening around, over and through the competition, Speed Racer (Emile Hirsch) is a natural behind the wheel. Born to race cars, Speed is aggressive, instinctive and, most of all, fearless. His only real competition is the memory of the brother he idolized the legendary Rex Racer, whose death in a race has left behind a legacy that Speed is driven to fulfill. Slated for release on May 9, 2008, Speed Racer marks the Wachowski brothers first writing/directing collaboration since The Matrix movies. Joel Silver, who previously worked with the Wachowskis on The Matrix movies and V For Vendetta, is producing the film under his Silver Pictures banner. The film stars Emile Hirsch (Lords of Dogtown) as Speed, Christina Ricci (Black Snake Moan) as Trixie, Matthew Fox (TV's Lost) as Racer X, and Oscar winner Susan Sarandon (Dead Man Walking) and John Goodman (Evan Almighty) as Mom and Pops Racer. Rounding out the main cast are Australian actor Kick Gurry (Spartan) as Sparky; Paulie Litt (TVs Hope & Faith) as Spritle; Roger Allam (The Queen & V For Vendetta) as Royalton; and Asian music star Ji Hoon Jung (popularly known as Rain), making his major feature film debut as a rival driver. Based on the classic series created by anime pioneer Tatsuo Yoshida, the live-action Speed Racer will showcase the kind of revolutionary visual effects and cutting-edge storytelling that have become the benchmarks of the Wachowski brothers films. Speed Racer is a Warner Bros. Pictures presentation, in association with Village Roadshow Pictures, of a Silver Pictures Production. Check out the Original JAPANESE version of the SPEED RACER intro! I am always an e-mail away!